Elderly outreach is a local service club that enables students to provide friendship and entertainment to residents of local nursing homes. 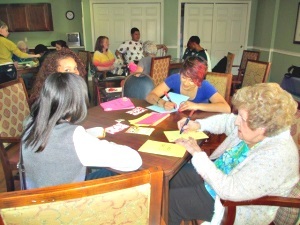 As a member of the club, students will get the opportunity to talk to, make crafts with, and watch performances with the residents of Capitol Ridge Assisted Living Home. It is a fun and relaxed atmosphere, allowing students to easily connect with residents. The group visits Capitol Ridge every Friday afternoon from 3-4 p.m. Located on Smith Street, Capitol Ridge is a short 5-minute walk from campus. We meet in the Chapel Basement Library at 2:45 p.m. and walk over together.